Beautiful almost to the point of fairytale, Lausanne is a small city with a lot going on. It’s the regional capital, home to Switzerland’s highest court, the International Olympic Committee, two universities, a school of design and numerous multinationals. There’s also an extremely rich arts scene, and an impressive and varied collection of museums and some seriously beautiful architecture. The gateway to ski runs, it sits right on the beautiful Lake Geneva. 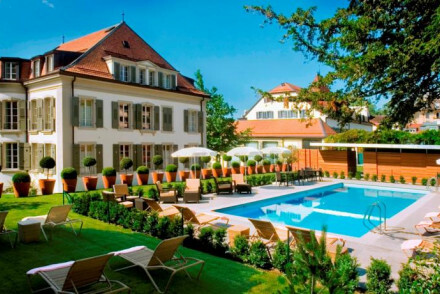 The best places to stay in Lausanne take advantage of the location and the rich life on offer. And of course you’ll want to explore the car-free medieval centre of town: Ville Marché for its wonderful markets, and the Cité on the hill, the impressive Gothic cathedral which dominates the skyline of the Old Town, the castle and a collection of museums. The charming medieval rooftops and maze of old cobbled winding streets are a true joy to get los in. The Olympics Museum is definitely worth a look, it's very good, but it’s also very niche. And the Palais de Rumie is also worth visiting, it’s a beautiful building, and home to five museums. Make a trip to the Foundation de l’Hermitage for the views alone, and the Collection de l’Art Brut will amaze and possibly baffle. If you’re looking for the hippest bars and restaurants in town try the Flon district; once just derelict warehouses, there’s now a lively arts scene, numerous galleries and theatre venues and plenty of restaurants and bars. Being in Switzerland, Lausanne is in the heartland of chocolate-making: don't miss the L'Espace Chocolat - where you can learn the art of making chocolate, and samle your own creations! Blossoming throughout Lausanne are exotic and colourful plants while east from Lausanne is the wine growing region of Lavaux, and the Swiss Riviera. To the west, all the way to Geneva, is La Côte, a popular area for English expats. Be sure to book a cruise on the lake - from small motorboats to paddlewheel steamers - and drink in the enchanting scenery of the water mirroring the mountains. Stroll down the cobbled streets of the Old Town, past the galleries, chic boutiques and gourmet restaurants. Book a cruise on the waters of Lake Geneva! Learn the art of chocolate making at L'Espace Chocolat. Visit the 12th century Cathedral of Notre Dame! Check out the Olympic Museum. Immerse yourself in art at the Musee de l'Art Brut, a fascinating exhibition of art created by prisoners and psychiatric patients! Lausanne is as picturesque as she is thrilling. A cultural behemoth, you will find yourself submerged in bliss by her great arts scene, amazing museums and fantastic array of activities. Find out more by checking out our collection of the best places to stay in Lausanne! The Beau Rivage Palace is a wonderfully grand hotel which is proud of its luxury and hospitality. Set within ten acres of private gardens, it has wonderful views over Geneva and the Alps. There are 161 rooms and suites, plus a fantastic choice of restaurants (including one with two Michelin stars) and an award-winning, spoiling spa. Chateau d'Ouchy occupies a superb lakeside position and with this comes gorgeous views over the water to the alps. Rooms are classic contemporary in style, there's an outdoor pool, spa and a restaurant offering seasonal dishes from locally sourced ingredients. 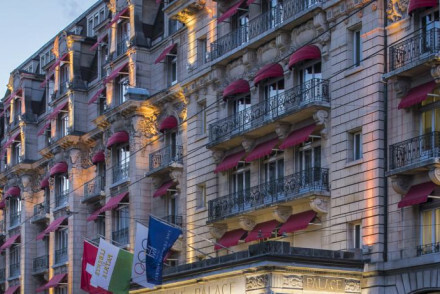 The Lausanne Palace will tick all the right boxes! A grand exterior houses luxurious bedrooms and suites, a pampering Spa (with specialist AVEDA hair spa), and Michelin starred dining. An opulent stay in the centre of town. Fly to Geneva Airport, get a direct train to Lausanne, which takes 45 minutes. The best time to go is during the summer, when the temperature ranges between 15 and 25 degrees. 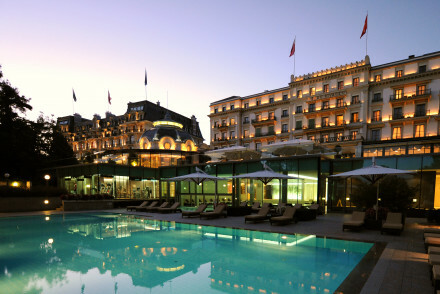 Full of opulence and heritage, Lausanne Palace is a sparkling five-star hotel. No expense is spared with its palatial rooms, state-of-the-art spa centre and four featured restaurants. A wondrous Swiss marvel. Romantic Break - An ideal getaway for two in the historic down of Lausanne, with fine dining, spa treatments and luxorious suites. Sights nearby - Visit the incredible Lavaux Vineyard Terraces, now a UNESCO World Heritage site. Sailing - Lake Geneva is a great place for sailing, rent a boat or charter your own. A historic 12th century castle, turned chic hotel on Lake Geneva. The elegant rooms exude understated luxury, and a certain tranquil charm. Large windows offer plenty of natural light, and views of the Alps. The spa, outdoor pool, gourmet restaurant and sleek bar complete the picture. Total relaxation - Unwind in style with an extensive list of massages, a sauna and a full service spa available to guests. Back to Nature - Well positioned on the shores of Lake Geneva and with priviledged views of the Alps. Sights nearby - The Lausanne Opera, the Vidy - Lausanne Theatre are both near the hotel. A stunning lakeside property set in pretty gardens and boasting gorgeous views. The individually styled rooms boast sash windows, chintz fabrics and parquet flooring. Enjoy the spoiling wellness centre and fine-dining Italian restaurant, with lovely terrace. An indulgent escape. Families - Family friendly with special rates for children's rooms, babysitting services and a kids menu in the restaurant. Total relaxation - A tranquil spot to escape from it all, sat between the beautiful Lake Geneva and the mountains. Superb hotel offering an oasis of grandeur, hospitality and unashamed luxury. Acres of private gardens and unrivalled views over Lake Geneva and the Alps. Award-winning spa, fantastic restaurants, tennis courts, and opulent rooms. 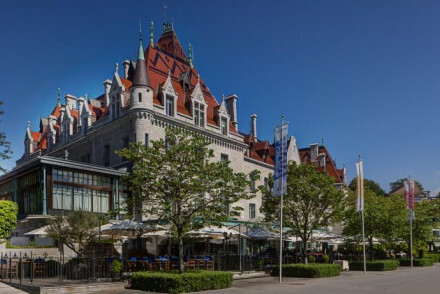 City Style - A traditional grand palace hotel on Lake Geneva, sitting in 10 acres of stunning grounds. Views - Fantastic views over the lake and the Alps.